Study: U.S. climate closely follows Pacific ocean cycle known as the PDO | Watts Up With That? This paper aims to identify and discuss the sensible weather trends in each of the ten climate regions of the U.S. affected by the natural oscillations representing the Pacific Decadal Oscillation (PDO) and the Atlantic Multi-Decadal Oscillation (AMO). By finding the correlations between the natural oscillations and the sensible weather, we can create composites and learn about their tendencies to better aid in forecasting the weather. The importance of the different modes of each oscillation has been found to vary among each of the climate regions of the U.S, as defined by the National Centers for Environmental Information (NCEI) (Karl, T. R. & Koss W. J., 1984) – Northwest, West, Southwest, Northern Rockies and Plains (West North Central), Upper Midwest (East North Central), South, Ohio Valley (Central), Southeast, and Northeast. It has been found that the different regions tend to be influenced differently by each of the oscillations and their modes, thus leading to variances in the regional sensible weather experienced in each mode’s time series. The most obvious effect on sensible weather that the AMO and PDO have can be seen from the temperature curves that are quite visible on the temperature time series (Kurtz, 2015). These indicate that the 1940-1978 decrease in CONUS temperatures was caused more by the negatively trending oscillatory modes of the AMO/PDO than other factors, and the 1978-2001 increase in temperatures was caused more by the positively trending oscillatory modes of the same oscillations. The small increase, or rather stagnant nature in U.S. CONUS temps since 2001, was likely due to peaking positive modes of the AMO/PDO. In the same way that the AMO and PDO can modify the regional temperatures, we see the same types of effects on precipitation, snowfall and drought in the different regions of the U.S.
Just as the sun rises and sets each day, thereby modifying our daily diurnal and nocturnal temperature cycles, the oceans also cycle and change on a regular and quite predictable time scale. On a daily, monthly, yearly and decadal scale, the oceans go through periods of warming and cooling on a large scale as the meridional overturning circulation (MOC) does its work transporting the oceans water around the world. Gilbert Walker has been recognized as one of the first to identify these periods of warming and cooling as oscillations, and oscillations that then have a profound effect on the weather trends across the globe, as early as 1908 (D’Aleo & Easterbrook, 2011). 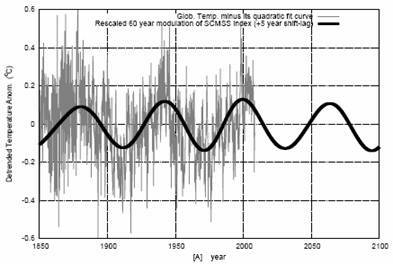 It was not until the late 1960s when these oscillations were first found to be statistically significant, and the weather community began to use them to predict and identify worldwide climate trends. 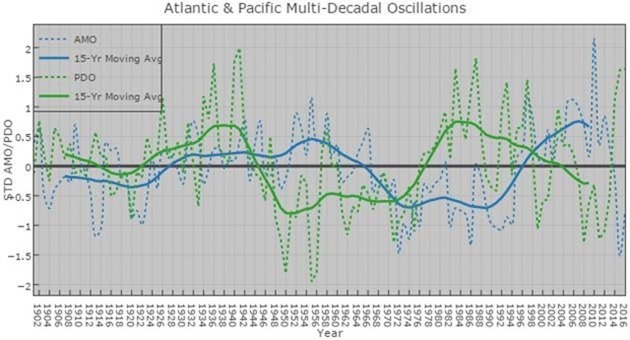 It was not until 2003 (Anastasios, Swanson, & Kravtsov, 2003, 2007) that models were created that suggested that these cycles, namely the Pacific Decadal Oscillation (PDO) and the Atlantic Multidecadal Oscillation (AMO) synchronized with each other. Using this as a base, we can explain the major climate shifts that have occurred since scientists began collecting data in the late 1800’s: 1908, 1932, 1973, and 2000. While the most noticeable change in these shifts was on global temperature, effects on the regional, sensible weather in the U.S. were also identified in these same time frames. Through analysis it has been theorized that these shifts are caused by the oceans, and are in fact the main drivers of the climate, and the sensible weather experienced in the United States (Klotzbach & Gray, 2009). North Pacific, specifically 30-50°N, 150°E-150°W. The PDO index (Fig 1) is created within this spatially defined area and then subtracted from the global mean anomaly from each NPAC grid point in the files used (Mantua, Hare, Zhang, Wallace, & Francis, 1997). During a negative (-) phase, we see a warm North Central Pacific, with a cold ring around the East Pacific from the equatorial regions up the West US Coast and the Gulf of Alaska (GOA). During the opposite, a warm positive (+) phase, we see a cool North Central Pacific, with a warm ring around the East Pacific from the equatorial regions up the West US Coast and the GOA. (Klotzbach & Gray, 2009), which includes the pressure anomalies, further helping to identify effects on sensible weather in the CONUS. 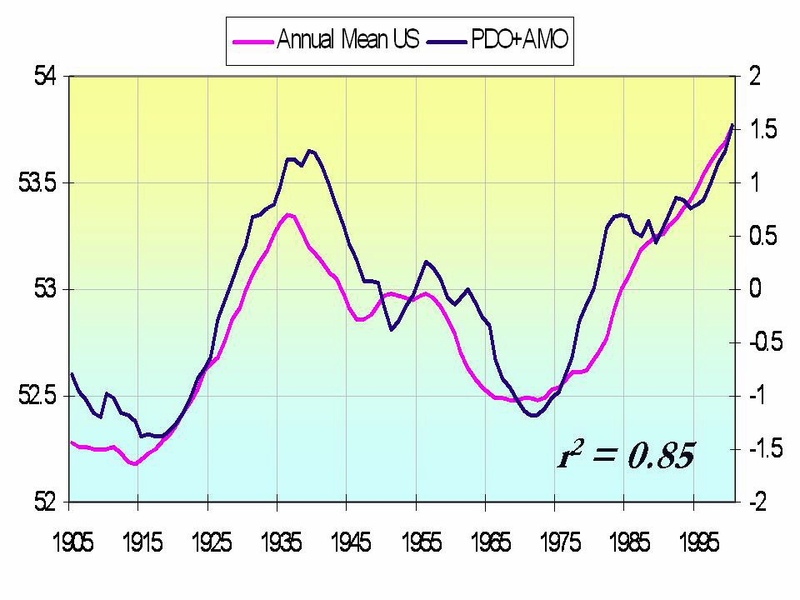 Within the corresponding time periods of the datasets used, it has been found that the AMO typically lags the PDO by 10-15 years (Fig 3), especially in recent years. In the period 1910-1950 they were much closer, with a correlation of 0.76 (76%) within the dataset. The correlation has decreased dramatically, in fact inversed, with a -0.49 (-49%) correlation value for the period 1950- Present. This may be due to dataset changes, with more accurate data in the later years, or it may be a function of the oscillation itself diverging. In any case, something like the current pause in contiguous U.S. warming today (and from 1932-1973) or the decadal drought periods and cyclical snowfall maximums, may be explained with the same root cause – these regular changes in the SSTs that we refer to as PDO and AMO. ← Coal Demand and Prices Surge… As Do U.S. Coal Exports! Why did it take so long to see this? Even the Inca’s understood this. Fill in the local noise with ENSO and you have a better story to go with the main characters. Hi, Remy here, author of the paper. The Incas sacrificed people to the weather gods. We sacrifice industries. We also sacrifice the poor who can no longer afford the energy they need to stay alive. Dr. Don Easterbrook has been saying this for years, even to Senate committees… I guess no-one was listening, or just didn’t want to. I believe this refers to Peru and the Spanish The Spanish arrived in Peru and recognized the weather events that arrived around the Christmas season in some years. The Spanish named this “El Nino” or The Child, referring to the Christ child. The Incas had dealt with the same weather and thought that the extremes could be lessened with sacrifices. The name El Nino is really, really politically incorrect because the name comes from the colonizers naming a local event for their god. No one has mentioned this however because they don’t speak Spanish or understand history. It’s been used for a very long time dating from about 400 years ago. I also chuckle because, of course, we all know that extremes in weather have only occurred recently due to man’s activities. Every time I hear “El Nino” it’s an acknowledgement that the weather pattern has been happening a lot longer than our modern idea of “global warming”. I know Diann, I was pointing out the punctuation error. Plural of Inca is Incas. Being as we really don’t know what the global SST was in 1940 …. I’d say this paper could just as easily prove that the PDOAMO have nothing to do with it. I’m not even sure we really know what global SST is today. It’s all a bunch of mathematics that can be manipulated to create a desired result. An average of just under 75 million surface station records show air temps follow dew points. In no way is this correlation 100% proved and concrete, nor is this research done. It will likely be another 60-80yrs before we get a full understanding of the PDO and AMO given the datasets we have. Before 1940, as you say, it gets murkier. That said, I did not manipulate anything to prove anything in this paper. I’ve been thinking for many years now that it is possible to attribute the Millennial cycle to changes in the AMO and PDO as well. If these cycles slowly change in relation to each other that could create periods of long term warming and cooling. All it would take is a few years difference in their individual cycle times and they would fall into and out of sync over long periods of calendar time. The same is true with orbital and axial varibility as they modulate the lengths and durations of ice ages and interglacials. Congratulations to Irvington High School senior Remy Mermelstein, who competed at the International Sustainable World Energy, Engineering and Environment Project Olympiad in Houston, Texas, from May 3-8. Mermelstein, a member of the Science Research Program at the high school, earned the bronze medal in the Environmental Management and Pollution category for his project, titled “The Effects of the Pacific Decadal Oscillation and Atlantic Multi-Decadal Oscillation on U.S. Regional Sensible Weather.” He competed against 161 students from around the world in his category. Mermelstein advanced to I-SWEEEP after winning the grand prize at the Westchester Science and Engineering Fair, held in March. Correction. Remy is a freshman in college. His LinkedIn profile says he will have his B-Arch in 2021. The International Sustainable World Energy, Engineering and Environment Project Olympiad was this year. Before you finish, contact me so I can connect you to others working on the specification of solid fuel heating systems with extremely low emissions. This work is taking place in several countries with a focus on matching modern housing construction with suitably sized (small) very efficient heating systems. At the moment architects are largely working independently of those creating highly improves stand alone solid fuel heating systems, apparently in the belief that everyone uses gas or heat pumps. Something like that. One project is an initiative in Mongolia to combine modern modular construction to existing yurts and top drawer heating systems with a view to transforming the entire sector at the bottom of the pyramid. This builds on recent developments in combustion and localisation of production. It requires being multi-skilled so you will enjoy the company. Former Soviet republics are a major focus because of the scale of the need. Forecasting heat demand is crucial, obviously. Pretty good work considering just how dodgy sea surface temperature records and temperature records are. There are notorious problems with both data sets, so finding anything significant is remarkable. Best damned High School presentation ever! Studying climate regionally?!? That’s heresy! Doesn’t he know it’s called “Global” warming? The first 9 graphs are too small to read and if I enlarge them they get too fuzzy to read. This is the fault of the author not talking to an Adobe Photoshop expert who could have helped him in “unsharpening” the full image before reducing it for the image size here.The process is the opposite of what is normally thought to be the case, but when you enlarge you it, you don’t get the fuzziness. This is true with an very large percentage of graphs presented in many articles here. The labels and scales, and thus often the messages, are shrouded in deep mystery. I can show the linkage of how dew points set Tmin through water vapor feedback during cooling, if they look, they should see the same impact to due point temps as they see in air temps. Well, isn’t this kinda a “Duh” moment? Generally our weather systems come from the west to the east, so the sate of the Pacific should be a significant contributing factor. The only real question would be the magnitude of that influence, not a question of its existence. Now a paper from a high schooler. It appears that Steve Mosher, didn’t read his paper,where the author gave credit to people who helped him on his research. Also you didn’t make any comments on any possible flaws in the paper either,too lazy, Steve? Your stupid drive bye one line comments were once amusing,but now past boring level. Yeah, kind of highlights the talent we currently have solving our needs for analyzing climate data and understanding how it interacts. It shows that even high school kids can produce better information than climate modelers. Surely in order to make a decent climate model you have to have sorted out the PDO and AMO before starting? If this work makes a more accurate prediction of weather and climate than the main models, it rather undermines the claim that a human touch is visible in the climate record. Proponents of that idea will have to explain how humans cause changes in the timing of the PDO and AMO because that is the root of the variation. Mosher: You see the level of scholarship in mainstream climate science has a way to go to reach highschool. Steve McIntyre made this observation while trashing peer reviewed PhD research on the subject. “In my opinion, most climate scientists on the Team would have been high school teachers in an earlier generation – if they were lucky. Many/most of them have degrees from minor universities. It’s much easier to picture people like Briffa or Jones as high school teachers than as Oxford dons of a generation ago. Or as minor officials in a municipal government. Therein is why Tony Heller is writing a book about the lies and deceptions in climate science. BTW, SM, did he not give you a failing grade in your BEST work? That should be worth a chapter. Yet he gets its right. There, there now…. don’t let it intimidate you! You can work your way through it, if you try….. Typical Mosh Pit. Attack the author, say nothing about the paper. I thought you were a lukewarmer? Most of whom are entirely reasonable and prepared to consider either sides science as far as I can gather. In any event, would you criticise Mozart for his early achievements, at 5 years old? And what is Steven Mosher’s academic background? English Literature and Philosophy. Not much more qualified to pontificate on climate than weepy Bill McKibben, B.A. (Journalism?) a former gossip columnist. I’ll take my chances with A.W. Mosher is long past anything but CYA, damage control mode. They effectively say that, at least in the US, the temperature variations are dominated by natural cycles. And not much else. Ed, this a bit old fashioned these days to confine your conclusions to the area of the data coverage. Now, your heroes choose one tree from a forest in Siberia from among hundreds in a data set and use it to erase the little ice age and the medieval warm period and you say nothing. Oh I suppose I am exaggerating. They did also use a proxy from a Finnish lake bottom upside down to assist the analysis. You must confuse me with someone else. Those who know me know that I was a skeptic before they invented the word ‘denier’. I wonder what mixup brought on your comment. Ed Zuiderwijk: “They effectively say that, at least in the US, the temperature variations are dominated by natural cycles. And not much else.“. Ed – don’t you see the significance of that? The climate modellers tuned their models to make the CO2-attributed influence match the measured global temperature over the latter part of the 20th century – a period with two oceanic “up” phases and only one “down”. So one net “up” phase from the oceans was incorrectly attributed to CO2. This resulted in all the models predicting far too much global warming – ie, “running hot”. 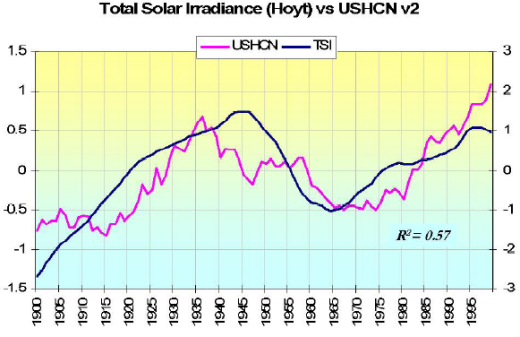 If you look at the graphs in the article, you can see that the ocean cycles are on top of a rising trend that started well before there was any significant amount of man-made CO2 in the atmosphere. It’s the same if you look at global temperature. So, that rising trend could not have been caused by man-made CO2. That in turn means that the tuning of the climate models to the measured temperature has made the models even more inaccurate – ie, run even hotter. After you have allowed for these two factors, there is virtually no measured warming left, for attribution to man-made CO2. In other words, if the climate models were re-tuned properly, they would attribute little or no temperature effect to man-made CO2. That’s about the gist of it, but my version is shorter. 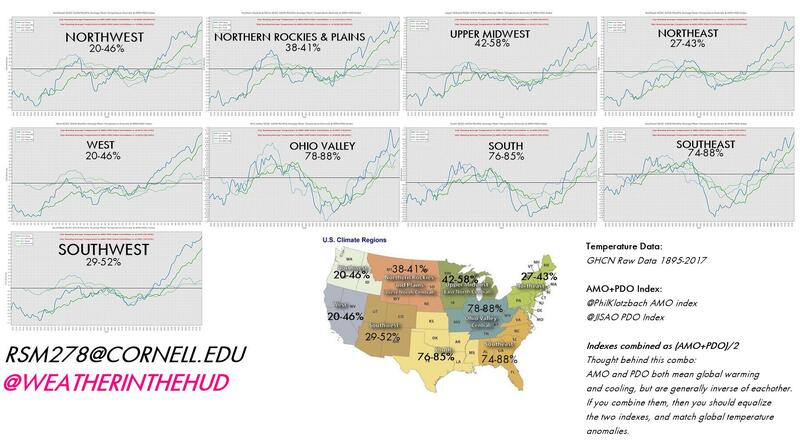 Three or four years ago at one of the Heartland conferences, Joe Bastardi presented a graph (like a table) in one of his talks about PDO and AMO + and – effects on the temperature, precipitation drought, floods, etcetera in the US. [Two positives, two negatives, one positive/negative, another negative/positive.] I watched it on video. I didn’t copy it then and have been unable to find it since. It was clear and revelatory. Wish I could find it. Whilst in no way wishing to detract from this young man’s great paper it echoes or adds to the work of Dr. Syun Akasofu, 2009. Great news and great work! That’s gonna be a bombshell for the billions of folk who chose to live beside the sea. Who would have thunk that a planet sized lump of water like the Pacific could have *any* effect on the weather. The East Equatorial Upper Ocean Temperature Anomaly is a fairly good predictor of UAHLT global temperature 6 months in the future. In the following plot UAHLT is scaled *4 and lagged by 6 months. Similar to after the 1998 El Nino, it appears more LT cooling is imminent. Very good HotScot – I’ve forwarded it to the Calgary Burns Club. 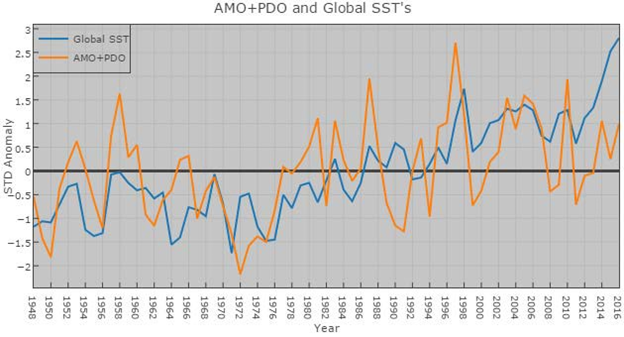 Hmm… AMO+PDO vs global SSTs shows good correlation up to 2015 where SSTs diverge wildly upward! Now what climate change took place in 2015! Why it was the Karlization of SSTs! This is a perfect demonstration of the simple-mindedness and of the mainstream climate changers and the deeply decayed level of talent, scholarship and integrity reached in academia. Joe D’Aleo and I have been publishing data on this topic since 2010. For lots of graphs and data see the references below. D’Aleo, J., and Easterbrook, D.J., 2010, Multidecadal tendencies in Enso and global temperatures related to multidecadal oscillations: Energy & Environment, vol. 21, p. 436-460. D’Aleo, J. and Easterbrook, D.J., 2011, Relationship of Multidecadal Global Temperatures to Multidecadal Oceanic Oscillations: Evidence-based Climate Science, Elsevier, p. 161-184. D’Aleo, J., and , Easterbrook, D.J., 2016, Relationship of Multidecadal Global Temperatures to Multidecadal Oceanic Oscillations: Evidence-based Climate Science, volume 2, Elsevier, p.191-214. Great to bring it to a wider viewership here! Thanks to all who have been engaged in this research! 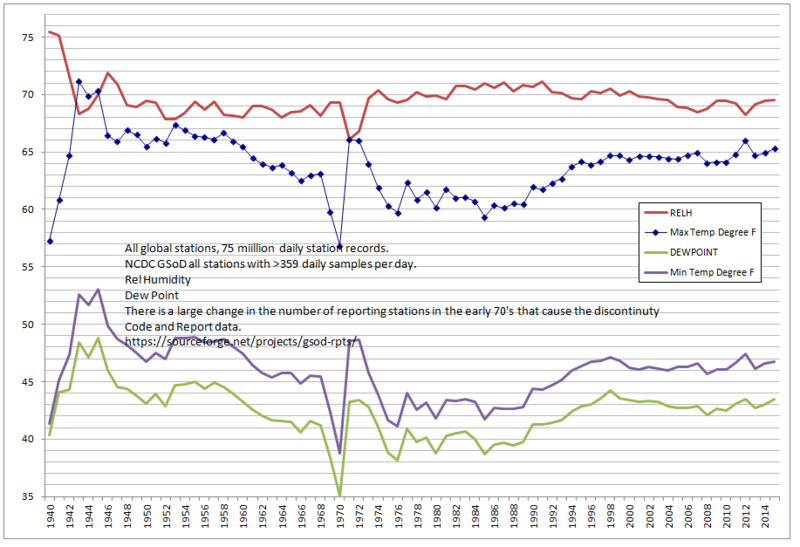 One of the graph Joe had some time ago is a detrended HadCRUT 3 global temperature graph. The cycle is clearly visible. I mention this since the cycle also is responsible for about 0.3 C of the temperature rise during the IPCC’s century, which is 1906-2005. As you can see the cycle was at bottom in 1906 and at peak in 2005. If you remove this obvious artefact from the IPCC’s signature “warming” last century it alone would lower derived values for ECS by about 40%. Which would mean CO2 is harmless. The Sixty-Year Cycle: Chinese time is traditionally measured in sixty-year cycles formed by the interaction of the ten heavenly Stems [wood, fire, earth, metal and water – green, red, yellow, white, black, etc] and the Twelve Earthly Branches [rat, cat, tiger, rabbit, dragon, snake, horse, ram, monkey, rooster, dog, pig – mid-winter, late winter, early spring, mid-spring, late-spring, early summer, mid-summer, late-summer, early summer, mid-autumn, late-autumn, early-winter, etc], the ancient astrological systems that were mapped against all cycles of human activity and natural phenomena. 2017 number in the sixty-year cycle 34. Indian astrology also have their own sixty-year cycle. 1987 number in the sixty-year cycle 4 which is number 1 in the Indian Astrological cycle. Indian cycle is lagging by three years to Chinese cycle. All-India Southwest Monsoon Rainfall presenting a 60year cycle coinciding with the Indian Astrological cycle. Global average temperature anomaly shows a 60-year cycle – moving average clearly demonstrates this – and somebody presented the equation of sine curve varying between -.03 to +o.3 oC. The Hurricanes also followed the 60-year cycle. All these I presented qualitatively in around 2000 and since then I presented in my books and articles. You did a really good job, Remy. That’s a pretty small region- 20 degree of latitude and 40 degrees of longitude. A degree being about 111 km- 2200 km by 4400 km roughly 9.7 million or bit smaller than US. Something as small as US affecting US and other countries. And a global effect. Contrast that to an idea that US land area has some effect upon the rest of the world [ a clue, it doesn’t]. Anyways I hadn’t thought about the smallness of these regions. Especially in relation to tropics which 40% of total global area [which obvious drives everything]. More specifically, tropical ocean which is 80% of tropical region- 510 times.4 times .8 = 163 million square km. And obviously the tropical region getting most of the world/s sunlight..
Yup. The jig is increasingly up, and ‘they’ know it. No, that would spoil the fun. I’d guess that there would be countless individuals and many companies who would love to sue the pundits for everything they got to compensate for the damage caused. UAH October is out and very strange. So strange that I think something has gone awry and errd the last two months of data. I can’t find a single time in the UAH data where the temperature increased 4 months in a row, even with El Nino conditions. Until now, and not has it increased 4 consecutive months, but it has greatly increased for the past 2 months. If there are no errors in the data, then this is very anomalous. Not just El Nino conditions. We also have low ice conditions in both the Arctic and Antarctic which releases added heat from the oceans. I suspect the Antarctic is the biggest added factor given the high ice levels for several years probably led to a build up of energy that has been released since the ice was reduced. I agree RWT and not just for October. Examine this plot and see how UAH is higher than expected for several months and has diverged from its strong long-term correlation with Pacific Ocean temperatures. I do expect the close correlation to re-establish itself. This isn’t bad for a high-school term-paper, but it reveals very little that is not already known. What it severely lacks is the appreciation that neither the AMO or PDO can be reliably treated as pure sinusoids for any practical purpose of prediction. Furthermore, unlike the AMO, the PDO is not a true regional temperature index, but the principal component of a regional temperature field. Thus the two cannot be combined in a physically meaningful way. As it turns out, the low-frequency cross-spectral coherence of the PDO with Western U.S. temperatures is entirely unimpressive. The AMO, on the other hand, is manifestly coherent with southerly U.S. regions dominated by airflow from the Gulf of Mexico–airflow strongly related to that which drives the Gulf Stream. It is good work, but the result does not surprise me. Some years ago I looked at correlating ENSO with dairy production in New Zealand, without much success: too little data, the uncertainty of weather in NZ, and the like. However, while playing with the concept I linked US dairy production with ENSO with much more success. Hmm! Must go back to the data and compare it with PDO! Something else to keep my retirement interesting. Not surprisingly, WUWT has covered some of this before, and by the proper suspects. I first read about the PDO in an article on the Science and Public Policy Institute By Joseph D’Aleo and Dr Don Easterbrook in 2010 . .
‘provocative paper showing the linkage between the Pacific Decal Oscillation (PDO) and the climate swings in the United States on a region by’ Climate swings? How about calling it what it really is – weather patterns swings.